Selenium Rich Recipes, Selenium Vegetarian Foods List. Selenium is a trace mineral which regulates thyroid, fights inflammation and many other functions. 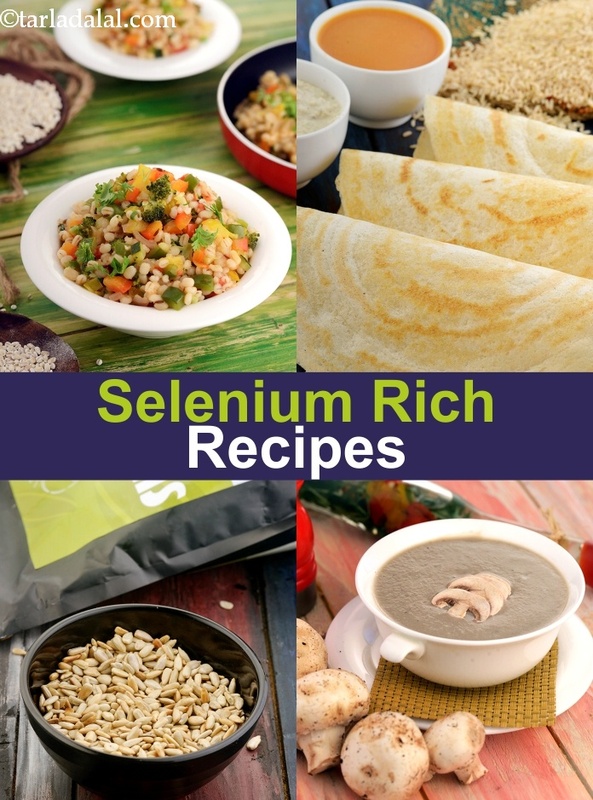 Ensure that you follow our Selenium Rich Recipes to get your selenium requirements. Barley being the richest source of selenium is a healthy option to include in your diets. Try the barley khichdi with lots of mixed vegetables. A variant is barley and moong dal khichdi recipe. The super thing is that none of these recipes have any rice added to it and hence no simple carbs added. My favourite is barley soup which soothes your sore throat or cures a bug in you. Broccoli is another selenium rich food. Broccoli is loaded with beta-carotene which converts to Vitamin A once it is inside the body. Vitamin A plays a critical role in maintaining healthy vision. Try this simple broccoli soup which is almost like a clear soup. Another super and easy way is to have grilled broccoli. Selenium though a trace mineral, it carries myriad functions in the human body. 1. Acts as Antioxidant : It acts as an antioxidant and helps remove the harmful free radicals from the body which are by-products of metabolism produced in the body mainly due to smoking, alcohol, stress and pollution. 2. Builds Healthy Immune System: It aids to boost the body’s defence system against various diseases. 3. Fights Inflammation : Being a potent antioxidant it also reduces the inflammation in the body. This ensures a healthy blood flow to the heart and all parts of the body. 4. Regulates Thyroid Function : It has been known to have active participation in the production of thyroid hormones. 5. Prevents Cancerous Growth : It’s role in DNA repair have proven its role in preventing the growth of cancer cells. 6. Maintain Cognitive Health: Selenium’s antioxidant activity is also known to retain cognitive health, maintain healthy brain cells and reduce the risk of mental illness, especially as you age. 7. Improves fertility : It is a mineral which preserves the health of sperms in men and avoids miscarriages in women. An adult on an average needs approx.. 55 mcg of selenium per day which increases to 60 mcg / day to pregnant women and 70 mcg / day. Kids usually require 20 to 40 mcg / day. Yummy and pretty to look at, these super tasty recipes are guaranteed to please your taste buds. Start cooking them TODAY! Enjoy our Selenium Rich Recipes, Selenium Vegetarian Foods List and othe mineral recipe articles below.